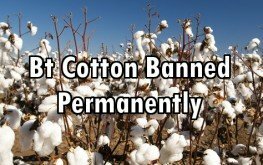 Following crop failure in seven different districts in Karnakata, where cotton growers faced devastating losses, Maharashtra Hybrid Seeds Company Ltd.’s (Mahyco) GMO Bt cotton has been permanently banned. Though not one of the biggest biotech companies, the news is still a remarkable blow back to the Big Ag monopolies trying to take root around the world. Mahyco was founded by “a man who dared to venture beyond visible possibilities and showed immense confidence in his vision. Post independence, when India was still in the process of fortifying her weak economic strength, Badrinarayan Ramulal Barwale sowed the first seeds of economic development,” or so says their website. But it also goes on to mention that funding was provided by none other than the Rockefeller Foundation. Apparently, you can turn back though, especially when people start waking up to the eugenics game being played on the world. The order was issued by the Director of Agriculture after, “the Bt cotton hybrid MRC-7351 and Nikki Plus supplied by Mahyco failed to give expected yields during kharif (pulses harvest) 2013. 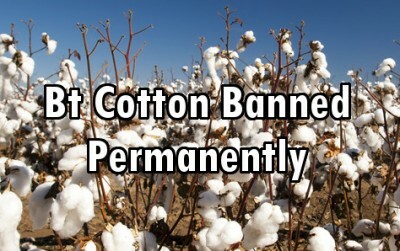 In Karnataka, 54,157 farmers who have grown Bt cotton supplied by Mahyco in 58,195 hectares suffered yield loss of more than 50 percent,” reports the Indian newspaper, The Hindu. The overwhelming response from farmers whose crops had all done poorly sowing Mahyco’s seeds pairs with a survey which established that crops had failed due to the substandard quality of seeds of the Maharashtra-based seed company. The department has since banned all Mayhco Bt seeds within the state, and the joint director of agriculture in Mysore has asked that seed sellers not promote their use, though cotton is usually grown in the rain-dependent areas of the state. Previously, Mahyco’s MRC-7351 and Nikkiplus BT seeds and saplings were cultivated on 139 hectares and 12,000 hectares, respectively. During a survey conducted by the Agricultural Minister’s scientific team, variations were found in the variety of saplings supplied by the company. Other seeds sown, that were not from Mahyco, performed much better in the affected areas. so,is it banned everywhere? i hope i hope ?